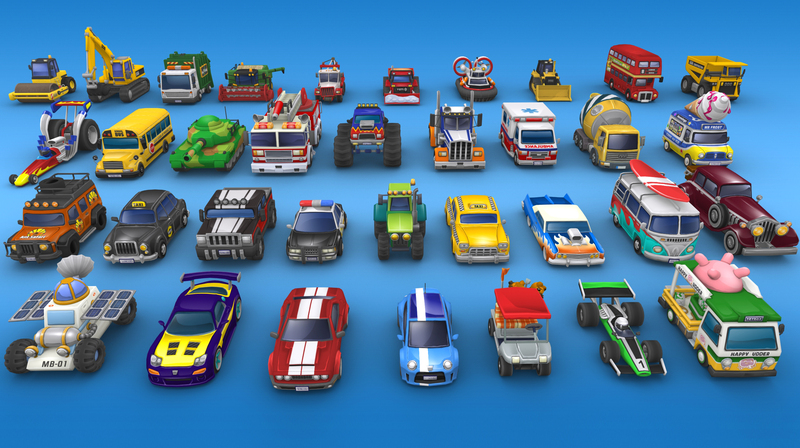 Toybox Turbos is Out Now! Today is the day buses jump off slices of cake, London taxis leap over cereal boxes and trucks use bonnet-mounted giant hammers to take out rivals in 18 nostalgic childhood locations, including a science lab, breakfast table, pool table and more. 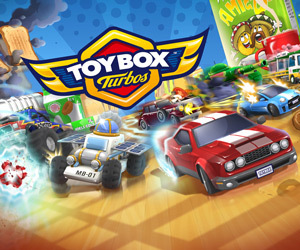 Toybox Turbos is bursting classic, retro-racing fun that includes six super-charged game modes designed for rapid fire competition. Sprint for the line in Classic Races, set your best time in Time Trial, pass as many turbocharged toys as you can in Overtake, avoid getting wiped out by the tide in Escape and beat the clock in Countdown. You’ll also take on bosses in multi-round Elimination mode – have you got what it takes to beat the best? Toybox Turbos brings alive the glory days of multiplayer score-settling competition with rapid-fire rounds designed for all action racing. Everybody knows multiplayer is where it’s at so grab three friends and hit the car mat! Put your opponents into a spin and a smile on your face as you use an army man bucket full of power-ups – lock on with the machine gun, drop mines to take out rivals, smash up opponents with a giant (ish) hammer and power past the other players with a turbo jet engine! Each of Toybox Turbos’ 18 circuits are packed with character and chaos. A charming art style brings nostalgic childhood locations to life, as school desks, breakfast tables, science labs and play mats are turned into fast and furious arcade racing tracks. Each track has obstacles to dodge, or if you prefer, to nudge your opponents into. Oh, and try to avoid falling off the edge of the table! There are 35 toys from seven different play sets to collect – can you collect them all? 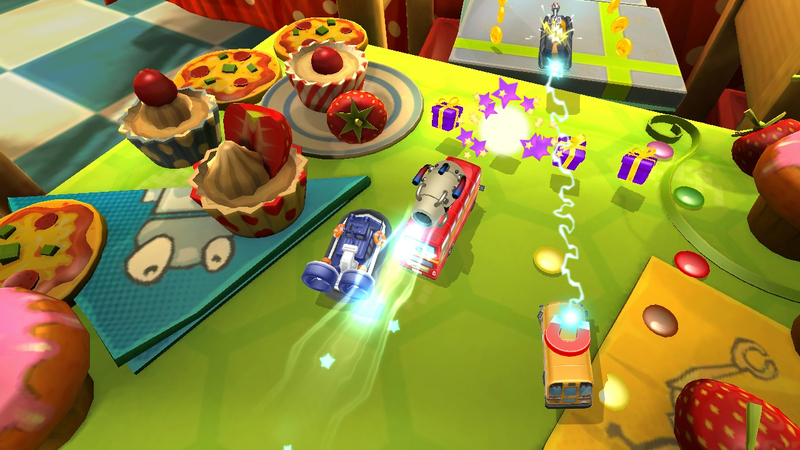 Toybox Turbos is out now on Steam, PlayStation 3 and comes to Xbox 360 on Friday 14th November. We’re also pleased to announce that a free Oculus Rift update will be available in December 2014 with a choice of two different cameras. The first is a chase camera that puts you right in the heart of the action. 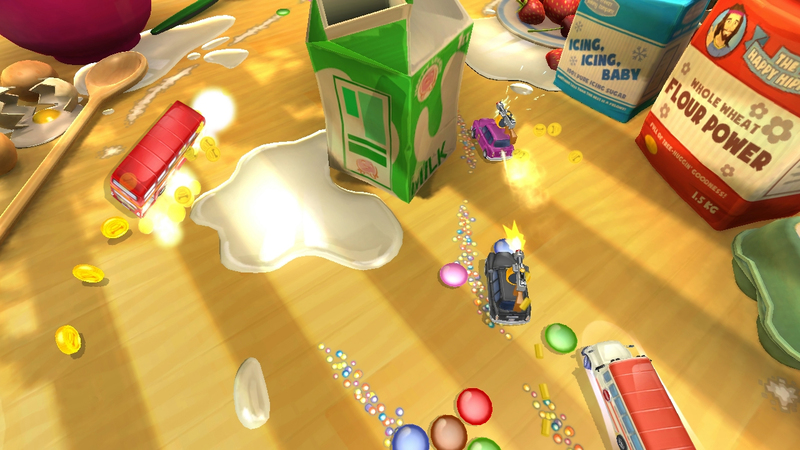 The second is a third-person view of the world from above that offers the player a unique perspective looking down on the table tops and recreating a believable feeling of playing with toy cars. Codemasters Community Manager, beard grower, biscuit stealer and fan of all things off road. Toybox Turbos Multiplayer – Four Times The Fun!